What would Easter look like without an Easter basket? For you, maybe it is not significant, but for your kid it is! This item is where they find their gifts, but also where they gather Easter eggs and other treats. Make your child’s Easter interesting with a funny gadget or with a funny shirt in his or her basket. If you want to see what options you have, showcased below you can find a selection of Easter baskets to choose from. If you are searching for a delightful Easter basket, check out the Bearington Plush Bunny Rabbit. You only have to see it in order to realize that your child will love it just as much as what it contains. Designed with a furry, soft outside and a pink silky satin lining, this item comes with a plush handle which folds down for convenient storage. The basket is perfect for the loved Eastern tradition that children enjoy so much. This product measures 12 x 13 inches and is made of polyester with a wire-frame handle. It is recommended using mild soap to keep it clean. Enjoy Easter with the Hatchimals CollEGGtibles Basket. You do not even have to worry about filling it, as it already comes with six special Hatchimals, four in-egg, and two out-of-egg. Your kids can hatch and care for their new friends, and carry them everywhere, using the heart-shaped handle. Four of the CollEGGtibles are hidden inside brightly colored ombre eggs. They are yellow at the top, with a pink bottom, featuring a purple-edged color-changing heart. To meet their new friends, your kids need to hold each egg, rub the heart until it changes color to pink and press down to crack the shell. Even if your youngest is too little to understand much of anything, you should not skip the traditional Easter basket for this special Spring occasion. GUND comes with the My First Easter Basket filled with adorable plush activity toys, with a lot of storage room. The playset contains an Easter egg squeak toy, a carrot crinkle toy, a bunny sound toy, and a chick rattle toy. This set also includes a coloring sheet as a bonus. The basket is suitable for all ages, as each item is designed with embroidered details for increased safety, and the surface-washable construction makes them easy to maintain clean. Prextex brings to the market a set of three Easter Eggs Baskets designed with assorted bright and cheery colors and details — mustard yellow, fuchsia, and light yellow. Made of high-quality BPA free plastic and measuring 8 x 5.5 inches, they are perfect for Easter egg hunts, and Easter goodies as well. The baskets are reliable and can hold many candies, Easter eggs, stuffed bunnies or other Easter favors. Their handles make them very comfortable to carry around but also fold down easily when not needed. 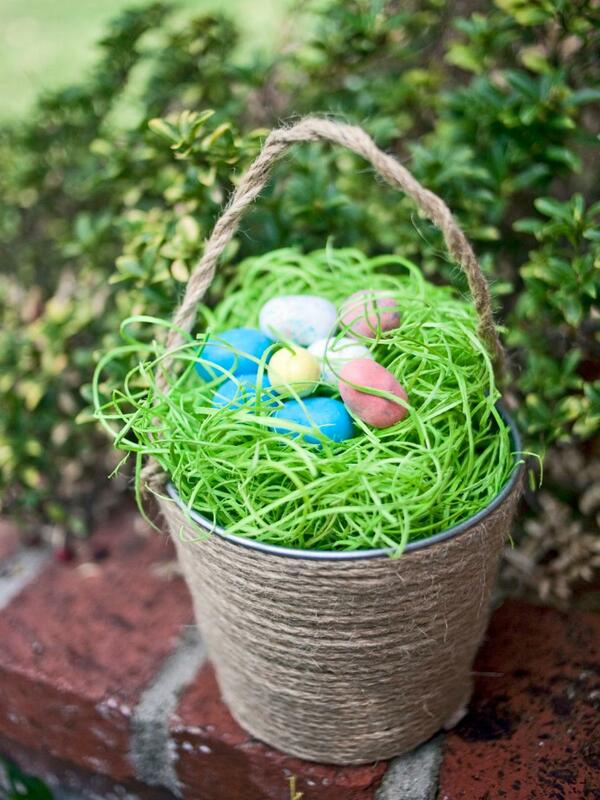 These baskets are cute and sturdy enough to use every Easter, for many years. The Easter basket is a significant part of this Spring occasion because usually, that is where your kid’s present is hidden. The GUND Baby Chick Easter basket is ideal for this event and is also suitable for children from age three and above. It is designed with a soft plush tote with cute embroidered eyes, beak, tiny wings and feet, and is seven inches in height. The adorable basket comes with a happy Easter message, and also a plush handle intended for petite hands. This item is perfect for collecting Easter eggs, or for filling with sweet surprises for your little one. Every holiday is a joyful occasion for the family to gather and spend some time together. Easter especially is a beloved holiday as it hints to the coming of spring, rebirth, regeneration of nature. Although Easter traditions tend to vary greatly from one region to another, the initial purpose of celebrating tends to be forgotten and is swallowed by all the advertising campaigns. However, the thing that remains constant is the joy of offering gifts to your loved ones. If you find yourself in an inspiration crisis and can’t figure out what presents to pick for your relatives and friends, all you need to do is bend the ear to all the seasonal manufacturers just waiting to come to your aid. With the wide variety of Easter related products on the market, it’s hard to choose something that will be both appreciated and useful and still manage to distinguish itself as a fun and memorable gift. Easter baskets are the answer that tradition has for your quest. A symbol of copiousness and appreciation, an Easter basket is both a gift to enjoy and to cherish. Highly customizable and adaptable to any age and preference, you can’t miss if you decide to make this kind of gift to your loved ones. When shopping for something as generic as an Easter basket, it’s important to lay out some conditions to make your quest easier. However, even if you have the time to browse through the best Easter basket reviews, you might not have the patience to do so. And let’s not forget that your precious spare time should be spent with your family and friends this time of the year. To come to your aid, we have put together a guide to help you make an informed decision and pick out the basket that best suits its consignee. Whenever you’re looking for a gift, it’s important to know beforehand how much you intend to spend and what you can buy within the established budget. Depending on your options, you can choose from anything between an ornamental gift basket wrapped in colorful paper and decorated with Easter symbols to a high gourmet basket fit for a more official gift, which is due to be a lot more expensive. Depending on your relationship with the person you’re buying the gift for, on their age and of course on your budget, surely there is an Easter basket on sale somewhere that fits your specific requirements. It’s important to consider whether the gift you’re buying is addressed to a young child or an adult. A gift basket for a child would contain more sweets and you should consider adding a couple of Easter toys. On the other hand, if you’re buying a gift for an adult person, you can opt for a more sophisticated selection of foods and maybe add a bottle of refined wine. Whichever the case, remember that variety is the symbol of wealth, and try to include many different items, both sweet and savory, both foods and drinks. Also, it’s a stylish touch to add some customized decoration. Perhaps the coolest easter baskets are the ones that are especially customized for the person they’re addressed to. In this market of endless ideas, it’s possible not only to find a basket that would better suit your friend or relative but also to customize it yourself, thus adding a personal touch and showing your appreciation. Surely anybody would appreciate a personalized gift more than a typical one that you can find in any department store. There are a lot of ways you can improve an Easter basket without having impressive craft skills. 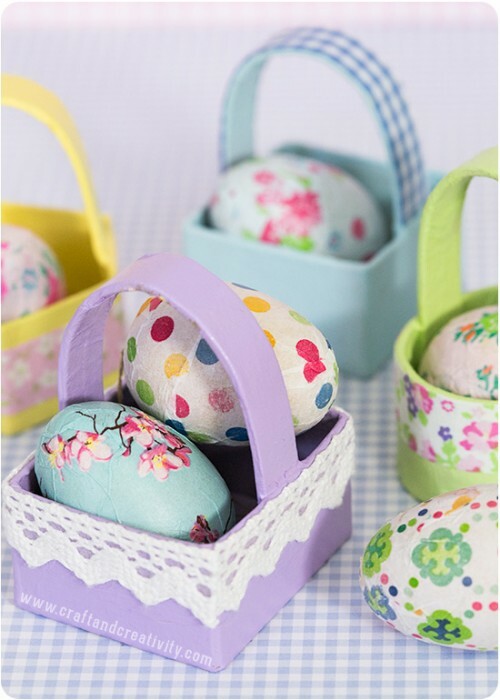 You can add some colored crepe paper, some fresh flowers or even paper flower for that matter, maybe some specific decorations like rabbit toys or chocolate Easter eggs. You can also bake something yourself and add it to the other goods in the basket if you want to show off your baking skills. Who’s to say the only thing you can put in an Easter basket is food? If you want to offer a sophisticated gift, a gourmet basket full of refined foods is one option. However, you can also fill a gift basket with luxurious spa items, massage oils, and body lotions. The main advantage is that you don’t even need to put the products together yourself, as there are many brands that commercialize gift baskets that contain just about everything you need for a relaxing spa-themed day in the comfort of your own home. However, nobody is stopping you from adding your personal touch to such a gift, as you can always decorate it with your favorite wrapping paper or add some Easter decorations. Whatever the occasion, the most important aspect of shopping for a gift is making sure it fits the personality and the preferences of the person it’s meant for. Easter gifts, of course, make no exception, and even though a basket is a rather generic gift that will most likely go for everyone, it shows respect and appreciation if you try to choose one that your friend or relative will truly appreciate. As far as Easter presents go, it’s not as much the budget as it is the intention. If the receiver of the gift can recognize your friendship and dedication, you probably made the right choice. If you want to make sure that your friends appreciate your gifts and if you’d rather spend your time relaxing and enjoying family gatherings rather than rushing through the town searching for presents, all you have to do is follow our rules. And if you’re looking for a cool Easter basket to offer to someone special, follow our advice, add your personal touch, some decorations and a couple of high-quality products and you can’t go wrong!